Vicky Su/Contributing Photographer BBQ chicken egg roll and falafel lettuce wrap. Social on State is exactly what its name implies: social. Upon arriving at the restaurant, I was greeted by the roar of conversation from the restaurant’s tightly packed and enthusiastic crowd. With an eclectic menu and expansive drink selection, it’s the kind of spot that would make any Williamsburg resident excited. Social has the kind of atmosphere that’s perfect for a large, hungry crowd looking for a couple of special drinks. The structure of Social on State’s Restaurant Week menu is tied to its social ambiance, as you’re encouraged to order three courses from a wide array of creative dishes for a flat rate of $25. Social boasts a fun and colorful menu, with choices ranging from falafel to egg rolls to macaroni and cheese. Settling on three dishes will prove a happy dilemma, and as such, sharing with a friend becomes a no-brainer. The photographer who accompanied me was on the same page, so we made a pact early on to share all three courses of our meals. The first course of my meal, the BBQ chicken egg roll, was an early highlight. 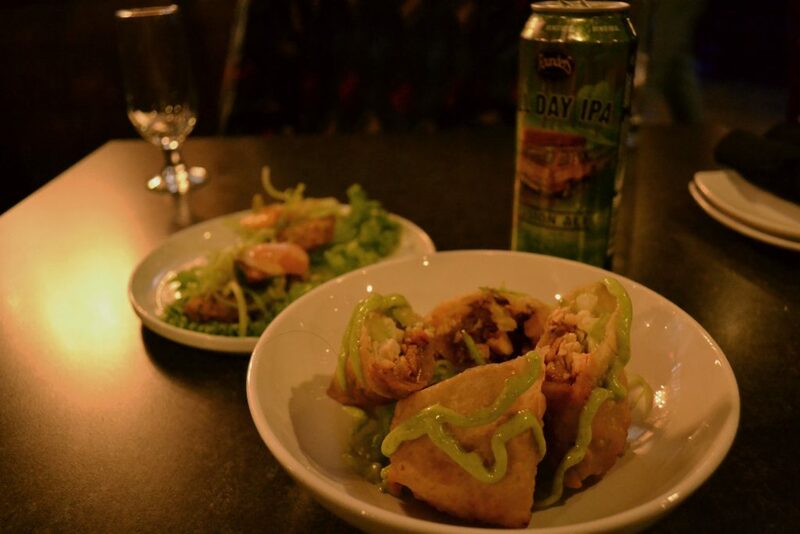 The combination of the egg roll shell with barbecue chicken, bacon, caramelized onions and avocado aioli made for equal parts indulgent comfort food and decadent culinary fusion. The savory chicken and sharp avocado dressing blended seamlessly, treading a fine and impressive line between guilty bar food and premium restaurant quality that I loved. Next, I had the falafel lettuce wrap, featuring large lettuce leaves that made the dish difficult to navigate. The combination of falafel, lettuce, cherry tomatoes and Thai curry sauce was delicious, but getting the right distribution of each on your fork was challenging. It was an awkward arrangement of elements — aesthetically pleasing, but not mindful of its consumer. For my main course, I had the octopus poke bowl, with sliced octopus, sushi rice, kimchi, scallions, sweet chili soy glaze and seaweed salad. The poke bowl is the kind of meal any sushi lover revels in, and I quickly took a liking to this recipe. While it is not a dish welcoming to those who rarely eat sushi, its niche will be apparent to all those enticed by its description. I then had the chicken curry, which was a tasty and standard take, but rather unimaginative on a menu with so many creative arrangements. However, the portion was generous and filling, making this one of the better choices for getting the most of your $25. Lastly, we were served our desserts. The first was the poached pear, which featured a peeled pear and vanilla ice cream dressed in honey and cinnamon, garnished with a mint leaf and all topped off with a crisp gingersnap cookie. The dessert was excellent, but again, it was a challenge structurally. I can say with confidence that this is one of the few dishes I’ve ever had that required the use of both a spoon and knife at the same time. If you’re patient, though, the poached pear is a great cap to a filling meal. The tiramisu arose as the true star of the dessert menu, as its rich cocoa mascarpone is given extra depth with the addition of Kahlúa. My bias as a chocolate-lover may be showing, but the taste was heavenly. Regardless of what you choose, all of the dishes are a satisfying part of a night of fun banter and eclectic dining at Social on State, a gem among this year’s Restaurant Week’s participants.